Reading Hillary Clinton’s memoir, What Happened, is like reading a memoir from Jesse James which makes no admission that he ever robbed a bank. She talked about trivial matters from her life, repeated her excuses blaming everyone else for her loss, and gave virtually no recognition of her dishonest actions and lifelong opposition to liberal values behind the opposition to her. 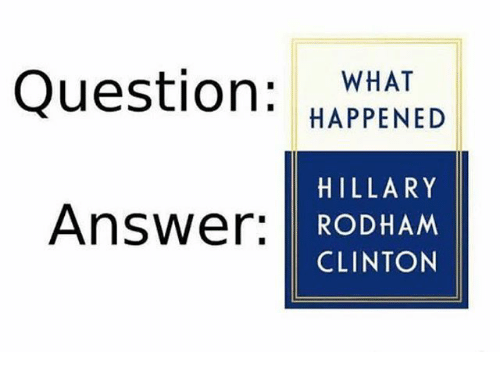 What Happened was previously used as a book title by former Bush press secretary Scott McClellan. Maybe she reused this title because Jeff Flake beat her to reusing the philosophically more honest choice, Conscience of a Conservative. Of course that would assume that she has a conscience, but she showed no signs of having one. At first, I had intended to keep relatively quiet. Former Presidents and former nominees often try to keep a respectful distance from the front lines of politics, at least for a while. I always admired how both George H. W. Bush and George W. Bush avoided criticizing Bill and Barack, and how Bill ended up working with George H. W. on tsunami relief in Asia and Katrina recovery on the Gulf Coast. And with George W. in Haiti after the earthquake in 2011. That’s how it’s supposed to work. She should have ended the book right there. In a rare moment of honesty, Clinton showed how clueless she is in writing, “in terms of fighting the previous war, I think it’s fair to say that I didn’t realize how quickly the ground was shifting under all our feet.” The only shifting Clinton has shown with the times has been to move on from blaming everything on the vast right wing conspiracy to blaming the vast left wing conspiracy against her. She might briefly admit to a mistake, but it is quickly followed with a major but as she places the blame on Russia, James Comey, Joe Biden, Bernie Sanders, or others. If she did mention something she did wrong, it was passed over as a minor tactical error, ignoring the magnitude of her ethical lapses. This week Bernie Sanders has been pushing for comprehensive, affordable health care for all Americans. Hillary Clinton is pushing a book which attacks the left and questions the validity of our electoral process (which she previously attacked Trump for threatening to do). She has opposed Medicare for All based upon false claims, continuing her long history of working to undermine liberal ideas. While she launched numerous bogus attacks against others, she feels that her mistakes are too trivial to be considered. She wrote, “The truth is, everyone’s flawed. That’s the nature of human beings. But our mistakes alone shouldn’t define us. We should be judged by the totality of our work and life.” Judging Clinton by the totality of her work and life, we must include her repeated push for neoconservative wars and regime change, her repeated advocacy of violating our First Amendment rights, her social conservatism, her support for the corrupting influence of money in politics, and her use of her position for personal financial gain–including violating the ethics agreement she entered into before being confirmed as Secretary of State. Clinton shows no understanding of liberal or progressive values. While she mischaracterized Bernie Sanders’ platform as offering everyone a pony, it is actually Clinton who sees liberalism as little more than government giving out ponies, even if smaller ones than she believes Bernie Sanders would. She has no understanding of how true liberal and progressives would change the status quo, no concept of the human rights we defend, and no concept of what is wrong with her interventionist views. Attempting to define reality is a core feature of authoritarianism. This is what the Soviets did when they erased political dissidents from historical photos. This is what happens in George Orwell’s classic novel Nineteen Eighty-Four, when a torturer holds up four fingers and delivers electric shocks until his prisoner sees five fingers as ordered. The goal is to make you question logic and reason and to sow mistrust toward exactly the people we need to rely on: our leaders, the press, experts who seek to guide public policy based on evidence, ourselves. No, that is not what happened at all. On the other hand, the Democratic establishment has shown how they are willing to ignore reproductive rights. Clinton herself has also been to the right of Sanders on the issue, including her support for parental notification laws and expressing a willingness to compromise with Republicans. This is not surprising in light of her personal social conservatism on the issue and her mantra of keeping abortion”safe, legal, and rare,” stigmatizing women who have had an abortion. Her attempts to falsely portray Sanders as being to the right of her on abortion are similar to her claims of being to the left of Sanders on gun control, despite having run in 2008 as a “pro-gun churchgoer.” Of course while attacking Sanders and blaming him for her loss she overlooked the degree to which Sanders campaigned for her after the primaries were over. Her antipathy towards a fair democratic process includes a visceral objection to being challenged for political office. Clinton was no more honest in discussing the scandals which rightfully harmed her campaign. For example, she misquoted from the State Department Inspector General report to falsely make it look like the report supported her actions in the email scandal. In reality, the Inspector General report said exactly the opposite in showing how she violated policy. As we saw during the campaign, she keeps repeating the same lies about the scandal, including the statements from James Comey, regardless of how often the media fact checkers show that she is outright lying. Among the other personal discussions in the book, Clinton wrote, “Bill and I bought our home in 1999 because we loved the bedroom.” Now try to get that image out of your mind. Actually what she wrote after this was quite tame, including a description of the vaulted ceiling, windows, and photos. And then, “After waking up, I check my email and read my morning devotional from Reverend Bill Shillady, which is usually waiting in my inbox. I spend a few minutes in contemplation, organizing my thoughts and setting my priorities for the day.” The rest of us will not be able to see the writings of Bill Shillady as his publisher has pulled his planned book, entitled Strong for a Moment Like This: The Daily Devotions of Hillary Rodham Clinton, due to plagiarism. Of course, as was inevitable, I am seeing defenses of What Happened claiming that disagreements with Clinton’s book are based upon misogyny. What an intellectually and morally bankrupt viewpoint. Do such Clinton supporters have even a shred of integrity? I am just relieved that Hillary Clinton is not in the White House, leaving us to contend with claims that our objections to whatever war she wanted to start, or whatever violation of the First Amendment she was advocating, was based only on sexism.